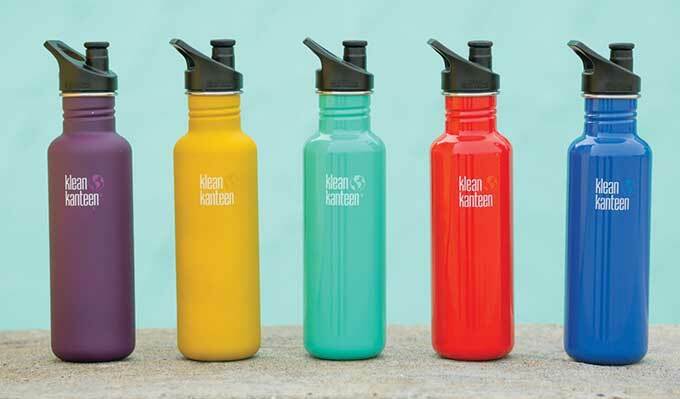 Klean Kanteen offers a range of stainless steel water bottles ($18+) that are well made, relatively lightweight, and come with a variety of interchangeable tops. They seal tightly (I pack them in my briefcase with my computer), even with the sport top. They’re light enough to compare well with a plastic water bottle, but without the ecological waste of disposable bottles or the odor of reusable plastic bottles. They come in various sizes (12 oz. to 40 oz.) and the 18 oz size fits nicely in a bicycle bottle cage. I take mine through airport security empty and fill it on the other side.